Bitcoin price declined further and broke a key support at USD 6,300 against the US Dollar. There was a break below a contracting triangle with support at $6,310 on the hourly chart of the BTC/USD pair (data feed from Kraken). The pair is currently under pressure and it remains at a risk of more losses below $6,200. Bitcoin price dropped significantly below $6,300 against the US Dollar. BTC/USD is accelerating losses towards the next supports at $6,100 and $6,050. Bitcoin price started a short-term correction after trading toward the $6,280 level against the US Dollar. The BTC/USD pair moved a few points higher and traded above the $6,300 and $6,350 levels. However, the upside move was capped by the 23.6% Fib retracement level of the last drop from the $6,720 high to $6,280 low. The price failed to move past the $6,400 and declined sharply. The recent decline was such that the price broke the $6,280 low. More importantly, there was a break below a contracting triangle with support at $6,310 on the hourly chart of the BTC/USD pair. It opened the doors for more declines and the price cleared the $6,200 support. It is now trading well below the $6,500 pivot level and the 100 hourly simple moving average. A low was formed at $6,145 and the price is currently consolidating. An initial resistance is near the $6,280 level, which was a support earlier. Moreover, the 50% Fib retracement level of the last slide from the $6,399 high to $6,145 low is also near $6,290 to act as a resistance. Looking at the chart, bitcoin price is under a lot of pressure below $6,300. If it continues to move down, a break below $6,180 could push the price towards $6,100 and $6,050. Hourly MACD – The MACD for BTC/USD is moving heavily in the bearish zone. Hourly RSI (Relative Strength Index) – The RSI is moving lower towards the 20 level. 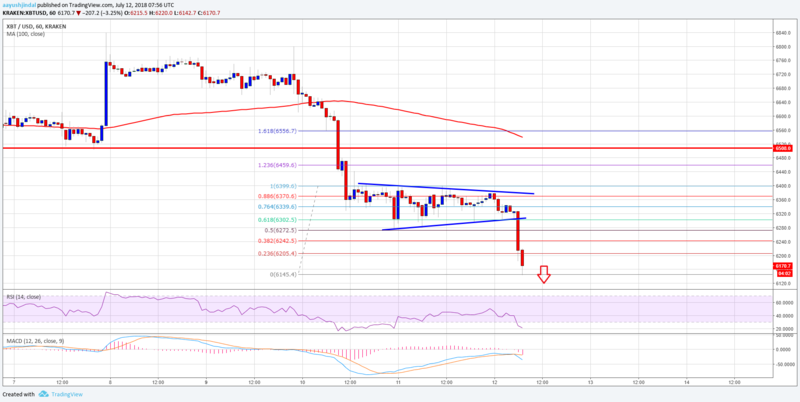 The post Bitcoin Price Watch: BTC/USD Trend Overwhelmingly Bearish appeared first on NewsBTC.